We all tend to have a lot of firsts. If you are adventorous or a risk taker, and want to live your best life (cue Cardi B new single; Best life featuring Chance the Rapper) get with the program. I am one of those who never shy away from trying new things especially when it comes to food exploration. I have enjoyed quite a few dishes and I am still yet to try out others, like escargot and frog's legs but I will not delve into that for now. Check out my Masai Mara experience HERE. Mandarin Restaurant is quite a popular Chinese restaurant in Toronto and I got to experience first hand why this is so. Not only are the prices quite fair but the food is amazing! From quantity (did someone say everflowing buffet) to taste and authencity. With various Mandarin restaurants spread across Ontario, 27 restaurants in particular from Brampton to Mississauga to Vaughan you definitely cannot miss one. The ambiance is very Asian, from the red room partitions to the fish and cutlery, and where the food is set up. i decided to go all 5 course meal and prayed that I would not get a bloated stomach. Quick sidenote, when going to an all you can eat buffet, i suggest small portions of food and going easy on the sauces and mixing it up. Do not be the guy at Mandarin restaurants that is known to have fish, chicken and beef in one serving. 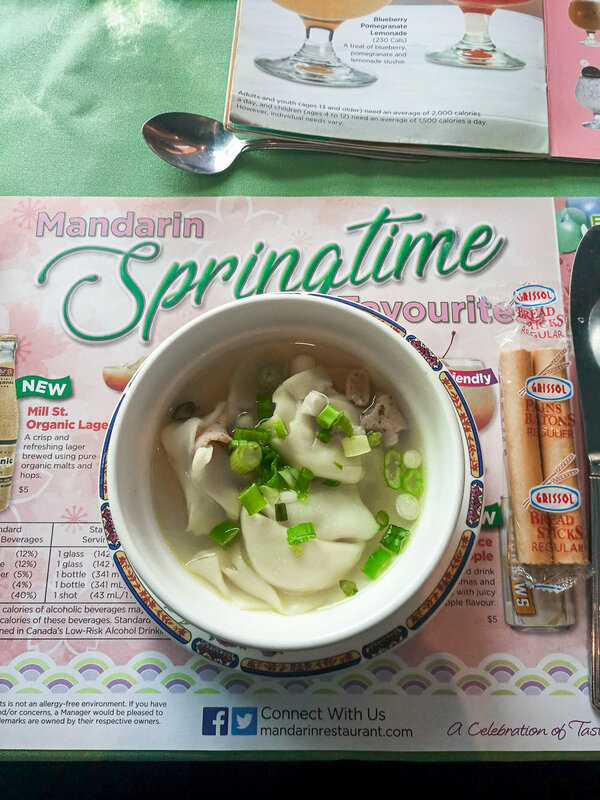 I started my Mandarin restaurant experience with the Wonton Chicken Soup, which are like chicken dumplings served in hot broth. Each region of China has its own kind of Wonton, I am not so sure which this particular one is from, would you have any ideas? My next serving was a fresh green salad, which has swiss chicken, corn salad, shrimp salad, seaweed salad, mixed grain and my favorite Thai mango salad. I know I talked about not mixing, but salads are perfect when mixed hence caesar salad. I have also been trying to add calories and watch what I eat because I am trying to gain weight and you can see that on my instagram stories and pictures. You can follow me @byfredanyona. My first main serving was more of something parents would try to feed their children. For the green and nutritous element, I put a little bit of sauteed mixed vegetables, sauteed green beans, potato fries, onion rings, black pepper steak (which is one of the best steaks I have had in Canada so far) , baked salmon and roasted potatoes. My love for potatoes is real! My "lets get thick 2018" attitude had me trying out another portion with sushi dishes teriyaki chicken rolls, fried shrimp and vegetable rolls and I topped it off with Mandarin Sriracha wings which is chicken dipped in a type of hot sauce or chili sauce made from a paste of chili peppers, distilled vinegar, garlic, sugar, and salt. For dessert i went for a kiwi fruit tart, slice of black forest cake and mixed ice cream flavours , which were caramel, vanilla and toffee, sprinkled with chocolate sauce. Trust me I did not eat again for another two hours lol. What would you not try from this menu and what would you love to try at Mandarin Restaurant? Do you have any suggestions of places I should try? Have you read my Moxie's post? I would highly recommend it, and I would recommend that you go with a friend or two to not only experience the food but you can also get to share and sample each other's food. Another recommendation is that you go there super hungry because there would be no point to go there on a half full stomach.